No matter which diet plan you follow, to lose weight successfully, you need to eat fewer calories than your body burns. But what every dieter dreads is constantly feeling hungry. Weight Watchers is a popular weight loss plan that's designed to help you eat less and lose weight while enjoying food and staying satisfied. Consuming zero point foods -- or free foods -- throughout the day is key to staying on track and keeping hunger away. In late 2015, Weight Watchers rolled out the SmartPoints plan, which replaced the old Points Plus plan. All fruits are 0 points on the SmartPoints plan, because, according to the company, participants should eat plenty of fruits and vegetables. Every kind of fresh fruit, frozen fruit and fruit canned in unsweetened juice are all counted as free foods. If a fruit has been dried, sweetened or canned in syrup, then you need to count the points. Because the effectiveness of the plan is based on foods that keep you full throughout the day without a lot of calories, when you juice fruit or use it in a smoothie, you need to count the points. Drinking is not nearly as satisfying as chewing your food, which means consuming your fruit through a straw might leave you wanting more. 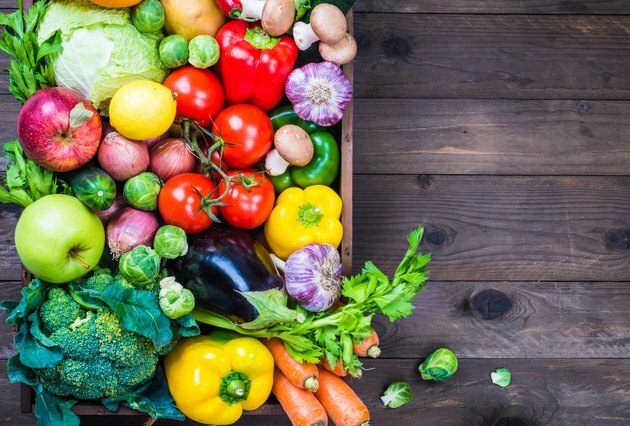 Non-starchy vegetables, such as leafy greens, carrots, tomatoes, green beans, asparagus, onions, broccoli and radishes are all 0 point foods on the SmartPoints plan. Vegetables give you a big nutrition bang for your buck, which means you get a lot of nutrients from a small number of calories. They typically have a high water and fiber content as well, which can help you feel fuller after your meal. Add extra veggies to your morning omelet or your favorite soup to make it more filling without adding any points. Starchy vegetables, such as potatoes, winter squash, peas and corn, are higher in calories and are not included on the 0 points list. These higher-calorie veggies are rich in nutrients, even though they contribute to your SmartPoints total, so they still deserve a place on your plate. According to Weight Watchers, if your food tastes delicious, you're more likely to stick to your eating plan. You can enjoy plenty of flavorings -- referred to as flavor boosters -- that you can add to your food for 0 points. Fresh and dried herbs, salsa, vinegar, hot sauce, mustard, reduced-sodium soy sauce, capers, citrus juice or zest, pickled jalapenos and unsweetened pickles are all SmartPoints free flavor boosters. Splash roasted veggies with balsamic vinegar, add salsa to a baked potato instead of butter and sour cream, and replace mayo with vinegar for a zesty tuna salad. A few snacks, such as sugar-free gelatin and sugar-free frozen pops, are considered free foods. Sugar-free beverages are also points-free. These treats might help satisfy your sweet tooth, but they don't carry any nutritional value. While free foods don't contribute to your points total, remember that many of them still contain calories. For instance, a medium banana contains 105 calories, and a cup of grapes has 104 calories. If you overindulge in fruit because it's a free food, those calories could add up, and you'd sabotage your weight loss. The USDA recommends that adults consume between 1 1/2 and 2 cups of fruit daily, and exceeding that recommendation will not be beneficial for weight loss. Vegetables are generally lower in calories and less likely to keep you from losing weight, but you should avoid eating any food beyond the point of feeling comfortably full. The USDA recommends 2 1/2 to 3 cups of veggies per day for adults. You'll get minimal calories from the sugar-free treats and beverages on the 0 points list, but over-consuming them might hinder your weight loss efforts as well. In fact, some research suggests that artificially sweetened beverages actually contribute to weight gain rather than weight loss, possibly because they affect the reward center in the brain differently from natural sweeteners, which results in a craving. For optimal success with the Weight Watchers program, enjoy your free point foods to help stay satisfied, but practice moderation, and focus on eating only when you are truly hungry.